One of my fondest memories of our travels through the Umbrian countryside this past summer was the delicious porchetta, flavored with garlic & fennel. 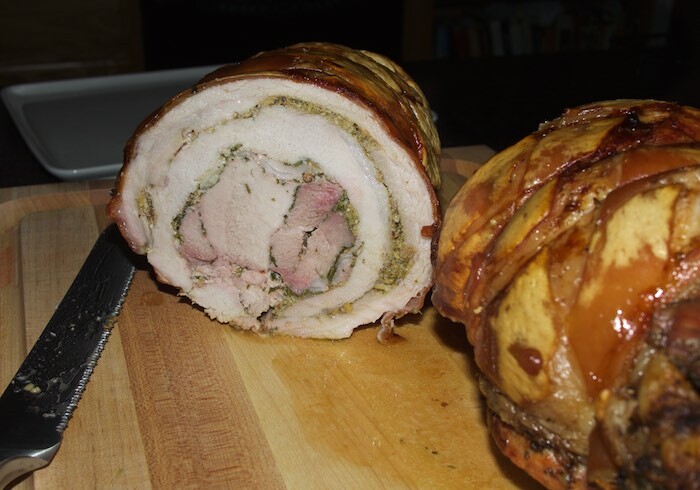 Porchetta is a common street food sold by vendors and macellerias (butcher shops) throughout Umbria. It is often eaten as a snack with bread or as part of a larger meal. To make porchetta, a whole pig is deboned and stuffed with lots of garlic and fennel and various pieces of pork. It is rolled and roasted until the skin is crunchy, and the meat is tender. Porchetta is by no means an easy thing to recreate at home but with help from your butcher and lots of time it is certainly doable. I found the recipe below at www.feastmagazine.com. 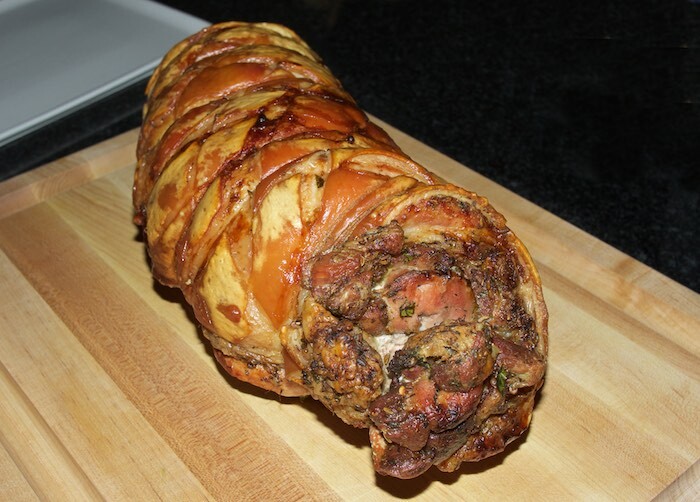 Though it might seem daunting the result is a porchetta that tastes very similar to what we ate in Italy. Begin preparation the day before serving; once the roast is assembled, it needs to refrigerate overnight before cooking. With the pork belly skin-side down, score meat in a cross-hatch pattern, 1/3-inch deep and 1-inch apart. Turn pork belly over, and using a sharp knife, score skin, 1/8-inch deep in a cross-hatch pattern about 1-inch apart. Turn, skin-side down, and set aside. Season skin side of prepared pork belly with salt. Turn belly skin-side down and place flat on a cutting board with the short end facing you. Season with pepper and more salt. Lay butterflied pork loin in the center of the pork belly and spread remaining pesto over loin. Arrange garlic, sage and pork fat on top of loin. Season with salt and pepper. Spread herbs over pork tenderloin. Toss pork shoulder cubes in remaining herbs. Place tenderloin in the center of pork loin and arrange pork shoulder cubes on top of tenderloin. Season with salt and pepper. Remove roast from refrigerator 2 hours before cooking. Preheat oven to 500ºF. Set oven rack on the second notch from the bottom of oven. Place room-temperature roast, seam-side up, on a roasting pan and transfer to the oven on the positioned rack. Cook for 50 minutes, turning once and rotating the pan. Reduce oven to 325ºF and cook until a thermometer inserted into the center registers 140ºF, about 1½ to 2½ hours. Remove roast from oven and allow to rest for 20 minutes before serving. Wow, look at all the flavor packed in there! Saving this - this is a recipe my husband and Dad would LOVE! This sure looks like its worth all the preparation. Oh man anything with pork and I'm on Board! This looks like one of those dishes you aim to impress guests with :-) love! Wow good for you for creating this at home. I bet the results are worth the effort. It sounds so delicious. I have never attempted this before. Wish me luck! That looks delicious! I've never even had porchetta before. Wow! I have never heard of or seen this before. My husband would LOVE this!!! The hard work paid off. Wonderful recipe. This looks incredible! Sounds intense to make it but definitely worth it. Impressive! This would be great for a special occasion.